The art of Walt Kuhn (1877-1949) is the subject of a major exhibition at DC Moore Gallery. Timed to coincide with the 100th anniversary of the landmark 1913 Armory Show, of which Kuhn was a principal organizer, this commemorative exhibition is long overdue. During his lifetime, Kuhn received great acclaim for the bold simplicity and psychological intensity of his modernist paintings of showgirls and circus performers. Since then, he has been given much less attention. This show is intended to bring his work back into the spotlight. A milestone in American art history, the International Exhibition of Modern Art, otherwise known as the 1913 Armory Show, is best known for introducing the American public to avant-garde European art. Kuhn was involved in virtually all aspects of the exhibition. Along with A. B. Davies and Walter Pach, Kuhn selected the European works in the exhibition and was responsible for its huge, if controversial, success, as well as its lasting impact on American painting and sculpture in the twentieth century. Walt Kuhn: American Modern will feature major loans from museums and private collections. Highlights include Trio, a large-scale painting of three circus acrobats that has not been seen in New York since the 1930s, on loan from the Colorado Springs Fine Arts Center, and Acrobat in Green from the Addison Gallery of American Art, which was given to the museum by Lizzie P. Bliss, an early Kuhn collector and one of the founders of the Museum of Modern Art. Two of Kuhn’s best clowns, Roberto and Portrait of the Artist as a Clown (Kansas), now in private collections, will also be on view, as will Sleeping Girl, a great, early painting of a showgirl in her dressing room, from the Ogunquit Museum of Art. In addition, Show Girl in Armor, Woman in a Majorette Costume, and other iconic images of performers will be included in the exhibition. 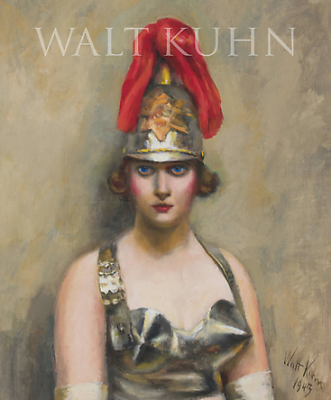 This will be the first major exhibition of Kuhn's paintings in several decades. The fully illustrated catalogue includes an essay by Gail Stavitsky, Chief Curator of the Montclair Art Museum. Another essay on his involvement with theater and the circus was written by Ralph Sessions, one of the curators of the exhibition. Focusing on Kuhn’s extraordinary portraits of popular entertainers, along with a selection of his still lifes and landscapes, the exhibition will reveal the range of his work and increase recognition of his key role in modern American art.